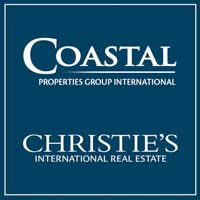 As agents of the Coastal Properties Group, we are proud to be part of Coastal’s affiliation with the Christie’s International Real Estate group. Christie’s International Real Estate is acknowledged as the world’s premier luxury real estate network. It has more than 32,000 sales associates in its network of 1,350 real estate offices in 46 countries. Admittance to the exclusive Christie’s network is by invitation-only to companies with proven records of success in high-value home sales. Christie’s Real Estate International provides MAXIMUM international exposure for your property! The network offers an incomparable level of service, worldwide visibility, lead generation, and instant brand recognition, resulting in impressive sales and procurement. Christie’s International Real Estate is a global network supported by the esteemed auction house. The Christie’s network offers exclusive homes to buyers worldwide, and by focusing on luxury residential real estate, they know how to access and serve a very discerning clientele. The Christie’s brand is instantly recognizable to clients and distinguishes your property from others. Entrust your property with agents affiliated with Christie’s International Real Estate and access qualified buyers worldwide. and what this means to you. Christies Auction House - Christies is the only real estate brand directly associated with an exclusive luxury auction house. Christies Auction House caters to high-end luxury buyers. Christie’s clients who buy and sell works of art often request real estate services. This gives the real estate division an ongoing relationship and access to these luxury buyers. The auction house has a monthly communication with over 200,000 luxury buyers and actively cross sells its real estate services to this group. Christies Luxury Brands – Christies owns a number of high end luxury brands like Gucci, Yves St Laurent and others. They cross market the real estate site to these buyers of luxury products. Christies Website - http://www.christiesrealestate.com/ attracts more than one million visitors worldwide every year and consistently ranks among the top results on major search engines for luxury real estates. The site is dedicated to luxury properties sold by Christies affiliates. The site displays the world’s finest properties in excess of US $1 million. The site is also heavily promoted to the qualified luxury buyers from Christies Auction House and the various Christies luxury brands. Christies International Real Estate Referral Program – Christies has 1,350 offices in 46 countries around the world with 32,000 luxury focused real estate agents. When these agents have a buyer looking for a property in our area they typically refer these to another Christies agent, knowing the vetting process Christies uses to select its affiliate partners.